The most commonly used resume is chronological. It is a very simple resume that list your education and experience in reverse order. So we need to list our most current items first. All of the samples I have provided are all variations of the chronological resume format. You might call these functional, but to me they are still chronological samples. Objective then skills, or Objective then Qualifications, the same, they just look different. Anyway it's your own choice. When you create your own, I am sure it will differ from my samples and that's ok. Create your own masterpiece and be proud it is different. The main thing, is that you get the right idea's to use from these samples. This resume will combine the skills you have accumulated from a variety of experiences. So your skills are going to be the highlight of your resume. View example of the skills resume. If you want to highlight your experience, you have quite a few years in your field, then I like the chronological resume format. On the other hand, if you are fresh out of college, and you have honed all of your office skills, computer programs, technical skills would be the format to use. Employers generally will be satisfied with both. What works best? To show your future employer your qualifications for the job they are hiring for. Have confidence with your final resume. It is your representation of yourself. All these samples are free for our visitors!! 2. Functional Resumes - What is it? The functional resume format is good to use for less on time job experience. It also changes into what can you do for the employer, instead of showing experience, you show all your skills. It takes the stance, skills and abilities takes precedence. The employer also knows that you are qualified for the position. Skills sometimes overcomes experience in the job selection. A recent graduate would use this format. They can handle the position, even though the real life past history is not there. The employer has a tough decision, so do all you can do, with your preparation. 3. Combination Resumes - What are They? This resume format is a combination of both above resumes. (Chronological and also the functional resume format). It provides a section for work history and also a section to show all your skills. (Chronological for work history, then functional for your skills section). I would use it if you have tremendous amount of experience and skills. This will probably turn out to be 2 pages in length. Ok, 2 pages would be fine with this format for any technical position. After all, you want to win the position offered, so if you feel inclined to give it your all, by all means, get these 2 pages completed. Make sure the final draft is relevant to the position. You could also, print out the examples above and edit them with your own information. Good luck. Then check out our job search page after you finish resume format. Which, out of the 2 resumes below do you think is the best? Open this example of the Best Resume in word. Just so you can see the example. Or are you going to vote for the resume below? Don't worry! Your e-mail will NEVER be given out to anyone and you will not get any unwanted e-mail from us or any third party Guaranteed! Now go to my resume templates a to i, download, and (save) it to your desktop. Backspace my information, and edit with your own. When you are done, review this list. 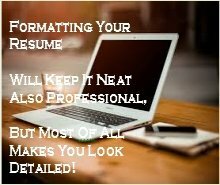 Check out the Inside pages for More details on creating your resume format. Go to Free Resume Templates To find your new resume. Please, review all the information on this website if you haven't already. The more you can educate yourself about preparing your resume, the better the chance of getting called in for the jobs you are qualified for.